Thanks to all of you — CRAMBA’s members, volunteers, and donors — 2017 was another great year of Mountain Biking and Advocacy here in Southeast Michigan. Our next in-person Chapter Meeting will be next Tuesday, January 16th, at Rochester Mills Brewery. The meeting begins at 7pm, and please arrive a bit before the start to allow time for ordering food and tasty beverages! Stony Creek Redevelopment Update: Volunteers continue to work with the Metroparks on the redevelopment of the mountain bike accessible trails at Stony Creek Metropark. We are currently planning for a professional design in 2018 and construction in 2019, funded by donations and grants. To help kickstart the design phase, CRAMBA has pledged $3,000 towards this first part of the project and will continue financial, planning, and technical support through project completion. Trail Improvements: During trail work days CRAMBA volunteers made numerous improvements to our local trails, including a new rock bridge and Wrong Way signs at Stony Creek, building rollers and skinnies to fix wet areas at River Bends, rebuilding berms at the Clinton River Park Trails, and restarting trail development at Columbus Park. IMBA Local Update: Early in 2018, CRAMBA, a chapter of IMBA, will move to IMBA’s new Local Program. This is the next generation of the Chapter program and the most visible change will be a switch to a low fixed cost per member per year. At current member counts and contribution levels we estimate this change will bring around $8,000 of your membership dollars, per year, back to CRAMBA. 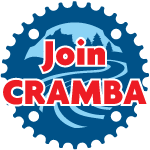 MMBA Update: CRAMBA continues to be a member of the MMBA, our state-wide mountain biking advocacy organization, and will continue financial support in 2018. REI Grant: Funded by a $5,000 grant from REI, CRAMBA volunteers installed new kiosks and bike repair stands at the Pontiac Lake and Holdridge Trailheads! River Bends Grooming & New Trailer: Thanks to a generous donation CRAMBA has a new drive-on-drive-off trailer for storing and transporting the River Bends Snow Bike Route (RB-SBR) grooming equipment! Jeremy Verbeke and Mark Senyk have been hard at work keeping the snow on the RB-SBR groomed and riding great. Chainsaw Training: This past Spring CRAMBA hosted a Forest Safety Instruction class for Southeast Michigan chapters at River Bends Park. Attendees received S.A.W.W. Level One instruction covering proper safety techniques, Personal Protective Equipment, and safe operation of chainsaws for trimming, felling, and clearing trees. Membership: CRAMBA currently has around 500 paying members, with an average membership level of $46.95. To support ongoing projects such as Stony Creek we are looking to increase this number in 2018. Successful Events: In 2017 we continued to host a number of successful events, from our fundraising Addison Oaks Fall Classic race to Massive Fallout, the GoT MTB clinics, ¡Ay CRAMBA It’s Cold Out!, and Take A Kid Mountain Biking Day. These events will continue in 2018; check out the CRAMBA Calendar or each event’s page for info as they are scheduled. Weekly Group Rides: The regular CRAMBA-supported Tuesday Night (River Bends) and Wednesday Night (Stony Creek) rides keep rolling! If you haven’t attended one of these rides, come on out and meet some of your fellow CRAMBA members. While the Wednesday night ride at Stony Creek is on hold for winter, the Tuesday Night Ride at River Bends is going strong on the RB-SBR. Check out the CRAMBA Calendar for more info.